This product is manufactured according to Swiss GMP Standards and Inspection. Tests before, during and after processing guarantee uniform quality and purity. 2 tablets under the tongue, 3 times daily, 15 minutes before eating. Allow to slowly dissolve in the mouth. 6 - 12 years of age: take half the adult dosage under the tongue, 3 times daily, 15 minutes before eating. Allow to dissolve in the mouth. Under 6 years of age: take Allergy Relief Liquid. Used in cases of bronchial asthma, relieving the feeling of tightness in the chest, difficulty in breathing which are also distressful concomitant symptoms of hay fever. It displays strong anti-allergic properties. 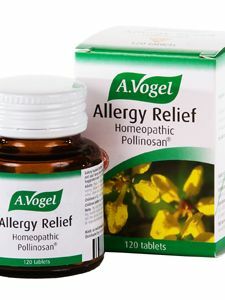 Has strong anti-allergic properties and is also indicated in cases of hay fever. It is directed against allergic inflammations of the nose and bronchial area. Used successfully in the treatment of allergic reactions, particularly of the skin (ie urticaria; nettle rash, hives). It is effective in treating allergic reactions caused by insect bites, medication or detergents. Clinical trials have shown an effect similar to cortisone which indicates its usefulness in allergies, and other inflammatory conditions. Used in treatment of allergic conditions of the skin and mucous membranes, where its desensitizing properties bring improvement. Clinical trials demonstrate its success in treating hay fever, allergic rhinitis, bronchial asthma, and allergic skin diseases. The positive experiences with this medicinal plant assign Galphimia an important place in the treatment of allergies. Brings excellent results in cases of head colds of a suppurative as well as allergic character, with a tendency to either a runny of stuffy nose. Fatigue associated with head colds and frontal headaches are favorably affected. Also, dry irritating conditions of the nose are improved. The plant has an anti allergic effect. Hay fever sufferers show a remarkable improvement. In the tropical forest of West Africa the natives use a powderized Okoubaka bark in treating every kind of poisoning. In our times, with allergies becoming increasingly frequent due to the increase of toxins and allergy-provoking substances, Okoubaka offers treatment for the basic symptoms complex of the allergy afflicted individual. Used as a treatment for reddening, itching, as well as allergic symptoms with sneezing in the rhino-allergic syndrome. Each tablet contains approximately 250 mg of lactose. No known side effects. Product may be taken when driving. There are no know side effects of drowsiness. In the first days of treatment, for a short duration, there may be a worsening of symptoms, which does fade. This is a positive indication that the body is responding to the treatment and, in such cases, the dosage should be reduced by half. Why does A.Vogel use only fresh herbs? Why is GMP certification important? When was the company Bioforce founded? 1. Are A.Vogel products organic? A.Vogel is certified as an organic growing operation. Herbs are organically grown using sustainable agricultural practices. Only the alcohol used in the extractions is not certified organic. Swiss Law requires A.Vogel to purchase the alcohol from the Swiss governmental agency. While not certified organic the extremely pure Swiss alcohol is made from a variety of grains, potatoes or fruits. For many years Switzerland has had strict laws in place regarding the use of fertilizers and pesticides, ensuring the purity of alcohol produced from their harvests. 2. Are A.Vogel products standardized? Absolutely! A.Vogel does not standardize to just one key ingredient. To standardize just one or two key ingredients, ignores other constituents, which can also contribute to the efficacy of the plant. This approach also ensures that the research is valid for subsequent batches of the products A.Vogel produces. From a clinical and scientific point-of-view, it is important to standardize to a wider range of components. This is why A.Vogel has always standardized to the whole plant.Why does A.Vogel use only fresh herbs? 3. Why does A.Vogel use only fresh herbs? Simply put, fresh is best! When plants are dried, a considerable portion of the components is lost. Extractions from fresh plants result in a product with a chemical profile quite similar to the plant itself. Dr. Alfred Vogel, founder of A.Vogel, found in his clinical observations that the effects are more profound with products made from fresh plants. For instance, an analytical comparison between an extract made from fresh Echinacea purpurea and the same Echinacea purpurea that was dried for 24 hours proved that the extract from the fresh plants had almost three times the alkyamides compared to the extract from dried plant. Recent research has proven that the alkylamides are a key active component. The extraction process produces a product that is more stable and more potent than an encapsulated dried herb. A.Vogel grows theplants it uses and controls every aspect from seed to bottle. Because of this, A.Vogel can guarantee the quality and consistency of their herbal products. 4. Why is GMP certification important? For Bioforce, Good Manufacturing Practices (GMP) applies to more than just the manufacturing process. It includes seed selection, cultivation, harvesting and post manufacturing documentation as well. This ensures the finished product will always be the same, batch after batch, year after year. To be certified, meeting the Swiss Pharmaceutical Good Manufacturing Practices, Bioforce is inspected regularly by the Swiss authorities. These are the same standards that the Pharmaceutical industry must meet. 5. When was the company Bioforce founded? Dr. Alfred Vogel founded Bioforce in 1963; however, Dr.Vogel began working with plants, producing plant products used as remedies and solutions to health related issues as early as 1923. Echinaforce, one of Bioforce s most successful products, has been on the market for over 50 years. Today, we can say that Echinaforce is the most researched Echinacea product in the world. In fact, Bioforce has been a leader in herbal research and development, and was recently recognized by the National Institute of Health (NIH) for significant scientific advances in dietary supplement research. This commitment to primary research is one of the main factors setting Bioforce apart from other herbal companies.